Lars And The Real Girl is an intriguing tale of a fragile young man lost in an odd, self-created delusion. Lessons about love, loss, family, and discovery all center around Lawrence (Ryan Gosling) and his girl friend, Bianca. Slowly, the entire town subscribes to the same delusion. And they all take the same strange journey with Lars and his lady. Top notch writing. Extremely original and entertaining. Unbelieveable at first, but the plot grows on you like a high school crush. Superb direction. Very well cast. All the actors did a great job and I'm surprised if this one didn't earn any awards. (It came out in 2007.) Sad at times. Funny at others. Very good pacing. Almost seemed too short. 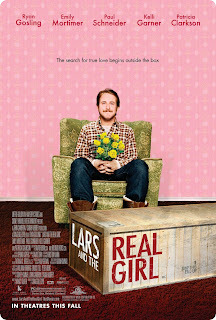 Lars And The Real Girl is in a class of its own. Comedy? Romance? I dunno. Where ever it lands, it is sets the bar high for others to follow. Likely a good date flick if the lady can skirt around certain subjects. Certainly not for the kids. Well worth a rental.